Another round of SnG Battles has just begun at Intertops Poker and Juicy Stakes Poker. 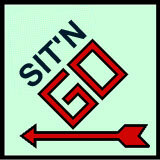 Players at the top of the Sit n Go leaderboard this week (September 22 – 28) will split $1000 in prize money. Another $1000 will be awarded to the top players September 29 to October 5. You can join these SnG Battles simply by taking a seat at any SnG game listed in either poker room (well, except double-up, kamikaze and satellite games). Playing at tables with higher buy-ins to earn more points than at lower buy-in tables. Naturally, winning, or coming close, also adds points and improves rankings. Lower buy-in tables are included in this promotion. The weekly prize money will be split between players in SnGs with a buy-in of up to $5 and between $5 and $10. Each week, the top 30 players in each category will receive cash prizes every Monday. “As we did with our last SnG Battle, prize money will be paid within 48 hours,” promised Intertops’ poker room manager.